Passenger Who Survived Fatal Flight Is Suing Southwest Airlines : The Two-Way A survivor has filed a lawsuit against the carrier, saying she now suffers from PTSD and other conditions after an engine explosion caused the death of one passenger and injured others. National Transportation Safety Board investigators examine damage to Southwest Airlines Flight 1380, which left one passenger dead and other injured on April 17. A passenger filed a lawsuit against the airline on Thursday. A passenger from the Southwest Airlines flight on which an engine part exploded has sued the carrier. Lilia Chavez, a California native, boarded a flight on April 17 at New York's LaGuardia Airport that was bound for Dallas. Twenty minutes later and at an altitude of 32,000 feet, the oxygen masks fell. Passengers heard an explosion, a window shattered, a woman was nearly ejected from the window. The plane made an emergency landing in Philadelphia, but the woman, a mother of two, died from blunt trauma to her head, neck and torso. Other passengers were injured. Chavez was sitting three seats behind the smashed window, according to the document filed on Thursday in the U.S. District Court for the Eastern District of Pennsylvania. The lawsuit alleges that the traumatic events of Flight 1380 left Chavez suffering from post-traumatic stress disorder, depression and other personal injuries. "Ms. Chavez witnessed the horror as the force of the depressurization pulled an innocent passenger partially through the shattered window and she watched as passengers risked their lives to pull the passenger back into the aircraft and save her life," says the document. It describes how Chavez "prayed and feared for her life" and heard other passengers calling their loved ones to say their final goodbyes. Chavez also "contacted her children to tell them that she loved them and that she was preparing to die aboard the crippled aircraft," says the lawsuit. Her lawyer, Bradley J. Stoll, told NPR that Chavez is "a very brilliant, successful woman who in her life has overcome very significant obstacles and is the matriarch of her immediate and extended family. This accident has crippled her will, and she is in shock over this horrible, near-death experience." Chavez has already been through hardship, according to an alumni video posted online. Her mother was killed when she 14, and she raised siblings who passed in and out of jail. She worked as a counselor in an adult college program before eventually receiving a doctoral degree. Her lawsuit alleges that the air carrier was negligent and breached its obligations – failing to warn passengers that the aircraft and engine had defects. "Rather than protect the safety of Plaintiff and those who also were fare paying customers, the defendants' misconduct placed profits and business over the safety of its customers and continued to operate these engines," it says. Southwest Airlines CEO Gary Kelly said at a news conference that the twin-engine 737 had been inspected two days before the incident. National Transportation Safety Board Chairman Robert Sumwalt said that a fatigue fracture likely caused the engine to fail, but that it would have been difficult to detect. A similar incident occurred in 2016 when Southwest Flight 3472 from New Orleans to Orlando, Fla., suffered an engine failure from a fan blade that broke off. 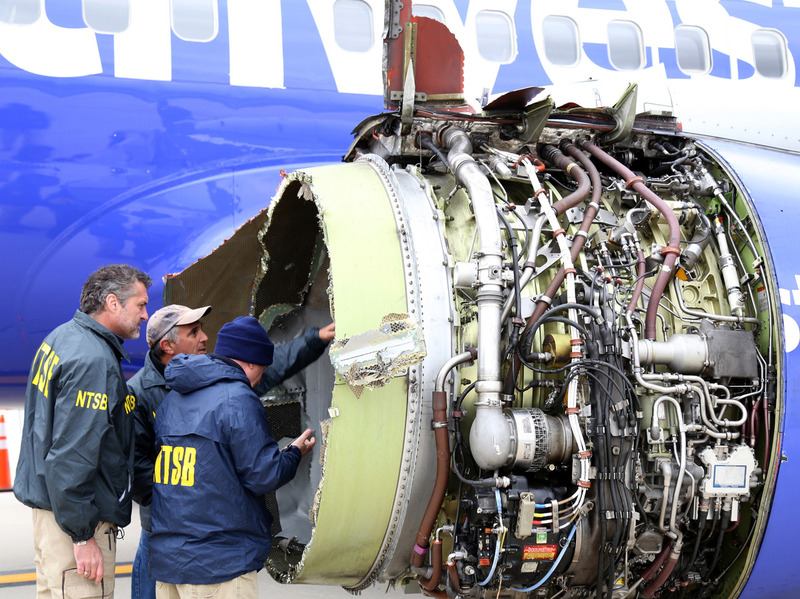 After that incident, Southwest disagreed with a Federal Aviation Authority proposal about engine inspections, reported Reuters. The air carrier believed the FAA "vastly understated" the number of engines that would require inspection and their cost. It reportedly told the FAA that not all 24 fan blades in each engine should be inspected. The lawsuit also names companies that designed, manufactured and sold the engines, including CFM International, GE Aviation and Safran. After the incident, Southwest sent out letters of apology, a $5,000 check and $1,000 travel voucher to the people who were on the plane that day. It responded to NPR by email, "Our focus remains on working with the [National Transportation Safety Board] to support their investigation. We can't comment on any pending litigation. The Safety and security of our Employees and Customers is our highest priority at all times." Chavez's attorney said the lawsuit is important because what happened could have been prevented. "This is a failure that occurred in the past and the decisions that Southwest and CFM International made will be under scrutiny in this lawsuit. And it affects every person who flies as passengers in commercial aircraft."